I present this series of maps to explain to my friends overseas why a tiny triangle of land on the edge of a cliff seems to have such earth-shattering importance for the Thai and the Cambodian peoples. The first map is from the 12th century. The Khmers are in red, the Thais are completely absent. In the next two maps, separated by a couple of centuries each, you see that the red is shrinking. 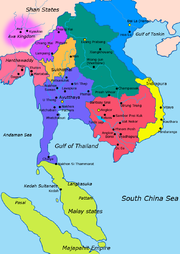 There are many different colored bits and most of them are different city-states controlled by Thai-speaking peoples (using the term loosely to mean all the main branches of the Tai language family). 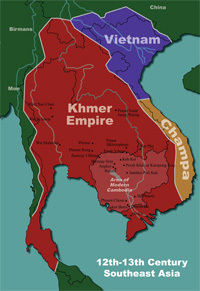 Then comes the fourth map, 1809: the purple area, almost identical to the red area of seven centuries earlier, is Siam. 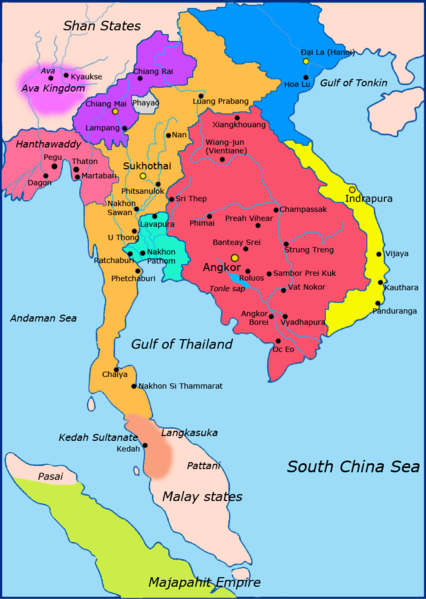 None of present Cambodia is under Khmer control at all. Then comes an 1886 map. The yellow part is Siam. And now comes 1873. 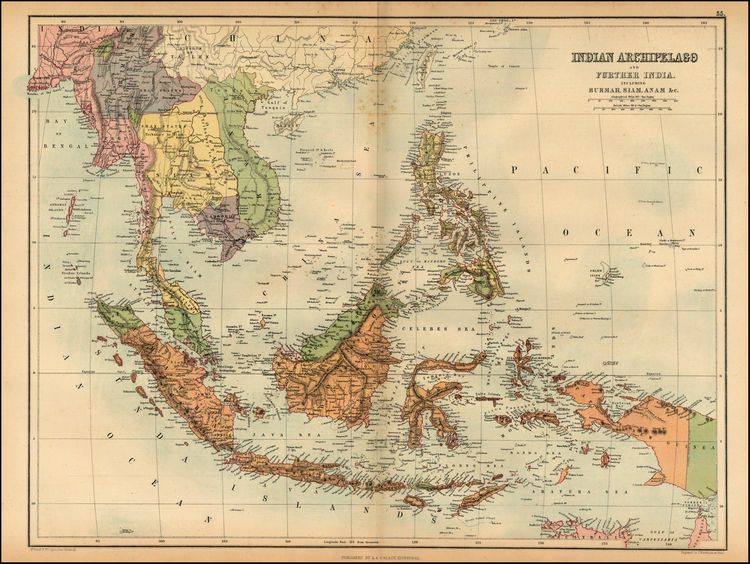 The French and British have made a grab for territory formerly under Siamese suzerainty. 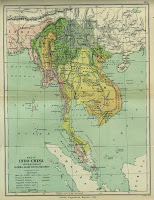 And finally, in this 1873 map, there reappears something called "Cambodia" - a central hub for the Khmer-speaking peoples. It's the purple bit. 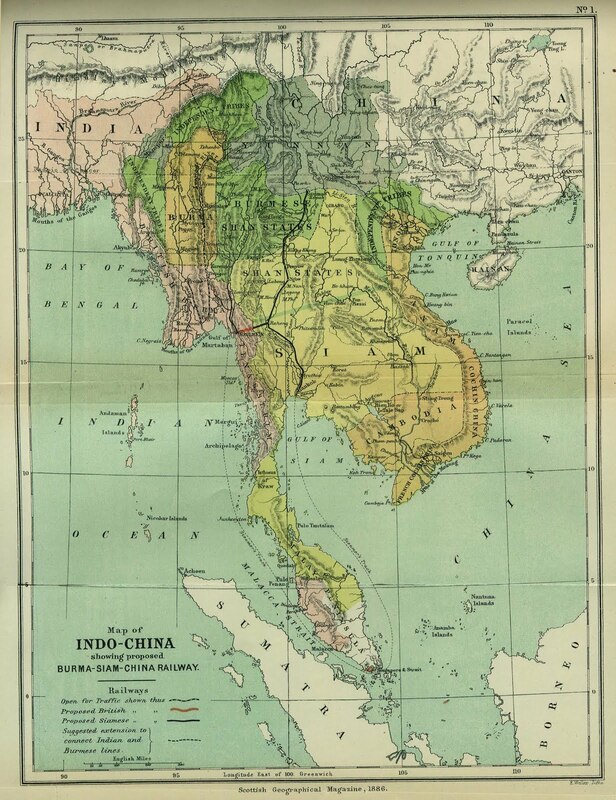 Around 1904, more gets grabbed and the territory now known as Cambodia becomes more or less the shape it is today. It is this hub, an administrative division of the French Empire, that will eventually become an independent country and a repository for the the dreams, hopes, history and identity that calls itself Khmer. And the rump of what was once the Siamese Empire is now the repository of those same dreams, hopes, history and identity for the ethnos that calls itself Thai. In reality, the DNA of those who built those two empires has long since mingled and every person who was born here doubtless carries some DNA of both. The people who built the temple on the cliff have been dead for centuries and no matter what language they spoke, it is almost certain that their descendants live on both sides of the disputed border. I think that the best avenue of healing would be to start by acknowledging the trauma wreaked by the colonial powers in this region. Then, moving back through time, people can begin slowly to understand and forgive the past. Memories are long around here, but they are also flawed, and too severely distorted by zealots. Would it be wonderful to move on and get this behind us? No doubt. Will that happen? Doubtful. A thousand years and an entire peninsula is being fought over by proxy with this tiny piece of land. 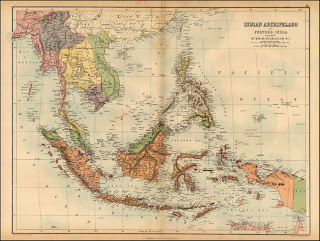 But don't forget that these kinds of maps are a very over-simplification of the real situation back then, as the western nation-state with fixed boundaries was only introduced to SE Asia at the beginning of the 20th century. Before, there were small fiefdoms which had allegiance to both of the major kingdoms around, so both kingdoms could count that fiefdom as being part of their territory. That's why both the French (on behalf of Vietnam) as well as the Thai thought they "own" what is now Cambodia. Still the best book on the topic is "Siam Mapped" by Thongchai Winichakul. Andy, that is a very important point (covered in one of my previous posts on this subject as well) ... However, since people in the region today have completely bought the idea of "country" as defined by western culture, they also see the past in those terms. That's one of the problems we have, the change in perception colouring people's interpretation of the past.